This hippie rock band from Canterbury started out as a psychedelic act, The Giant Sun Trolley in 1967. Regulars at the UFO Club, they also used the name The Hydrogen Jukebox and East Of Eden before becoming The Third Ear Band. Musically, they had an oriental, druggy influence, and much of the material was improvised and hypnotic. 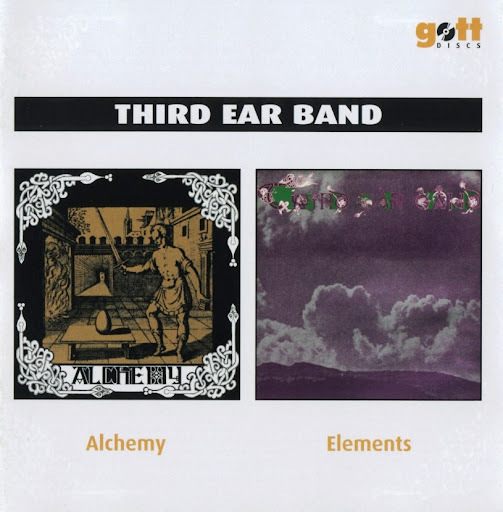 Of all the late sixties bands one might have predicted would survive for more than twenty five years, the Third Ear Band would not have been amongst them. An an early signing to EMI's progressive Harvest label, the first album, Alchemy showcased the band's sound: entirely instrumental, acoustic and largely improvisational with strong oriental and experimental jazz influences. The second album was in similar vein, although there were just four lengthy pieces, each named after an element. One of these, Water turned up on the Harvest sampler album, Picnic - A Breath Of Fresh Air. The Third Ear Band had a rather unstable line-up and half of the 1970 band quit. Glen recruited other musicians to take their place, including Simon House, formerly of High Tide and later of Hawkwind. The film director, Roman Polanski, commissioned them to write the music for his version of Macbeth and the band released the soundtrack as their third album. Music From Macbeth was the best of their early work, incorporating electric instruments for the first time along with medieval and folk elements. Although very much an underground outfit, The Third Ear Band were quite successful and all of their albums had reached the top fifty of the albums chart. However, Macbeth was to be the band's final release for seventeen years. In 1972 Richard Coff and Ursula Smith quit the band on the eve of a major concert in Hyde Park and would later form the band Cosmic Overdose, leaving a fourth Third Ear Band album Weird O'Clock unfinished. Glen soldiered on for another five years with various line-ups, including a 1977 line-up with Rod Goodway (ex-J.P. Sunshine/Magic Muscle), but the band were increasingly an anachronism and little interest was shown in them. In 1976, Harvest released a compilation Experiences on their bargain priced Heritage label. Nothing was heard of the band until a 1989 reunion with a completely new line-up. Lyn Dobson was a fairly well known player on the modern jazz scene and had been been a member of Soft Machine amongst others. Part of the subsequent tour was recorded and released in Italy as the Live Ghosts album. All subsequent recordings have been Italian releases. From what I've heard of the new line-up, they retain certain elements of the old band's sound, the druggy, improvisational, largely acoustic feel, but there is a much darker avant garde undercurrent. Denim (aka Denny) Bridges became an engineer/producer workingd for George Martin at Air Studios. In 1990 he moved to the USA where he's been producing about four albums a year. The most recent being Live Under Brazilian Skies by Annie Haslam of Renaissance fame. Paul Minns sadly died in 1997, but shortly before had recorded three new tracks with Ron Kort. Glenn who was ill at the time had to miss the sessions, which remain unmixed. In 2000, the bands unreleased 1973/4 album Weird O'Clock is due to be released as The Magus. All compositions by Coff, Minns, Smith, and Sweeney. Not trying to be a dwenor but I don't play with them anymore, although, I appreciate the mention and hope that particular album goes mega-platinum as I'm on it and wrote a few of the tunes. Super-Rad!